I’ve watched an interesting number of events unfold prior to my post here. The strangest was receiving an email from my mom this morning that felt very synchronistic because I haven’t discussed with her the topics I’m playing around with here. Here’s a quote from the article, “Elon Musk said that people would need to become cyborgs to be relevant in an artificial intelligence age. He said that a “merger of biological intelligence and machine intelligence” would be necessary to ensure we stay economically valuable. I would think that this was science fiction, or possible an article in The Onion, but no, this is in The Guardian. It basically speaks for itself. I don’t have an opinion about it, except to say that it doesn’t really surprise me. 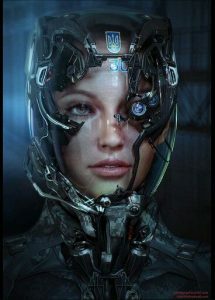 When I envision a “science fiction” future, I just assume the presence of cyborgs. I mean, considering how interwoven our lives already are with machines, electronic devices, and technology (Blue Tooth comes to mind), it seems obvious that the next step is to insert electronics into the body. But will it actually make people smarter? I don’t know. But I would say that we are watching a “cyberpunk,” “virtual reality,” and “artificial intelligence” future unfolding even as I write these posts.